General Information: Boulder opal is one of the most valuable varieties of opal, second only to Australia's black opal. Fine specimens of boulder opal can exhibit all of the spectral colors through their distinct play of color. Boulder opal was first discovered in Quilpe, Western Australia, around the year 1870. Almost all boulder opal available today is from Western Queensland's opal-rich fields, confined to an area of about 200 to 300 square kilometers. Physical Properties: Boulder opal is found embedded in large boulders of ironstone, which is how it earned its name. Occurring as pebble rock, precious opal develops within thin veins, fissures and hollows. As opal miners attempt to remove the embedded opal from the ironstone, some of the host matrix is preserved during the process. For this reason, boulder opal is sometimes referred to as 'opal in matrix'. Metaphysical properties: Boulder opal is thought to help alleviate depression and help find true love. 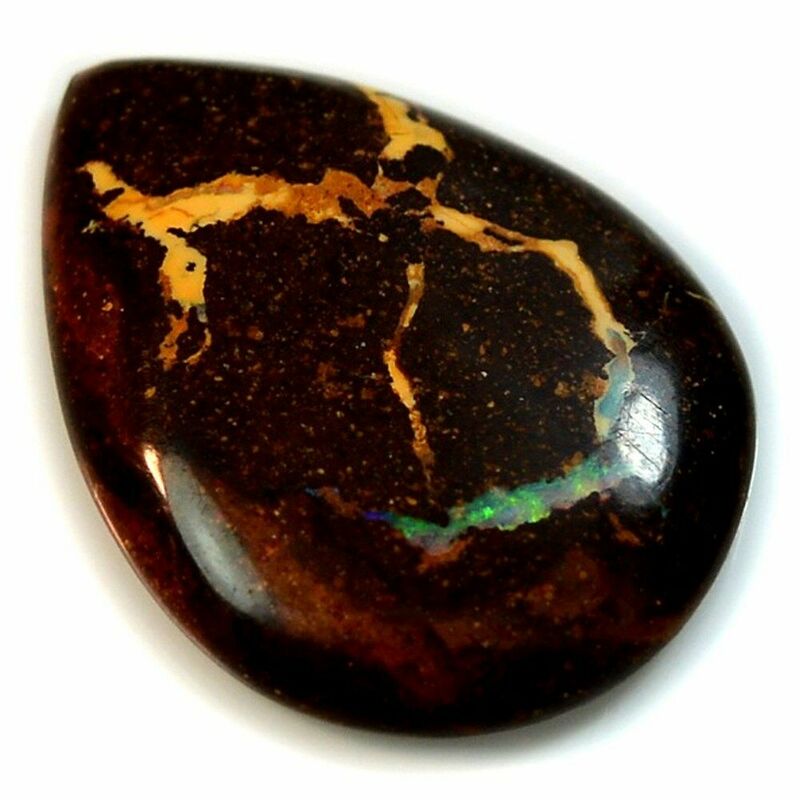 Since boulder opal can display a wide array of colors, it possesses a range of healing abilities. Boulder opal is October's official birthstone. Boulder opal is also the zodiac stone for Cancer, Libra, Pisces and Scorpio, and it is the astrological gemstone for the sign of Virgo. Boulder opal is assigned to the element of fire, although it can enhance all of the elements. Boulder opal channels a projective energy that can benefit all chakras. General Information: Jade is one of the oldest and most important gemstones, with a history dating over 7,000 years. It is especially prized throughout Chinese and Latin American cultures, often holding more value than gold. The name 'nephrite' was derived from the Greek word for 'kidney', which refers to its supposed ability to cure kidney disease. Nephrite is one of two distinct mineral forms classified as jade (the other is jadeite) and up until 1863, nephrite was believed to be one and the same as jadeite. Physical Properties: Nephrite is a fibrous aggregate variety of tremolite-actinolite, a basic calcium magnesium iron silicate, whereas jadeite is a pyroxene mineral. Nephrite is more common than jadeite and although it is slightly softer than jadeite, it is considered tougher due to its denser structure. Metaphysical properties: Since ancient times, nephrite jade has been used by many cultures for its powers. It was often used in burial ceremonies, since jade was believed to be an 'imperial gem'. Nephrite Jade is a protective stone that will transmute negative energies in your life into positive and uplifting ones. Nephrite Jade also helps open the Heart Chakra to allow good fortune to flow naturally into one's experience of this physical realm. General Information: Amazonite is also known as the Amazon Stone. Amazonite is a light green to light bluish-green color gemstone, with a soft and attractive color that can closely resemble that of nephrite and jadeite. 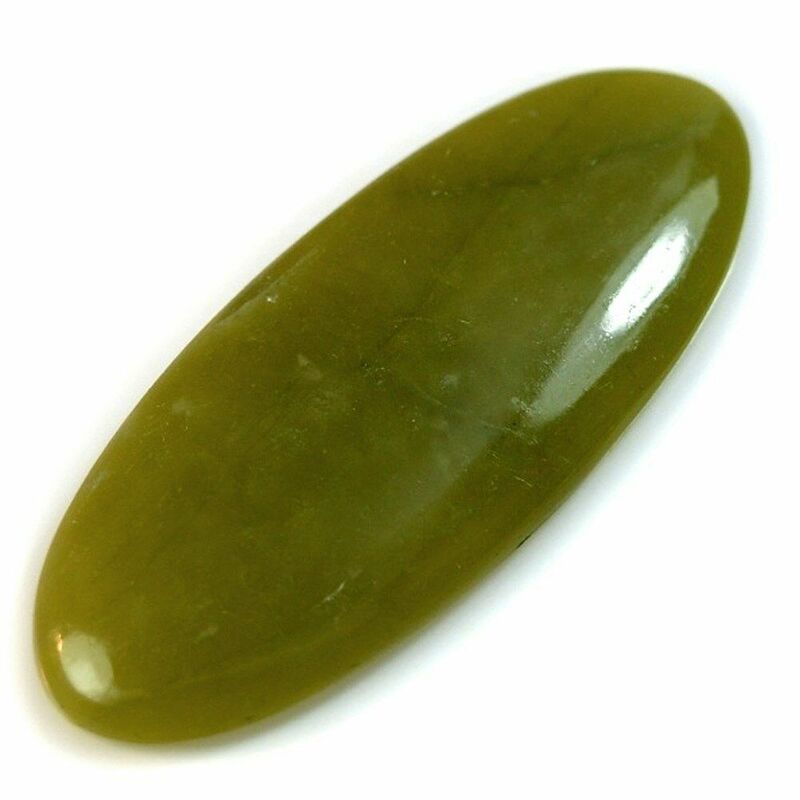 It is sometimes erroneously referred to as 'Colorado jade' or 'Pikes Peak jade' because of its close resemblance. Physical Properties: Amazonite is variety of green microcline feldspar. The feldspars are a fairly homogenous group of rock-forming tectosilicates that make up nearly 60% of the Earth’s crust. Metaphysical properties: Amazonite is a great stone and works on calming all your chakras. Not only that, it will help you balance your masculine and feminine energies so that you will be able to utilize them in the most positive way. 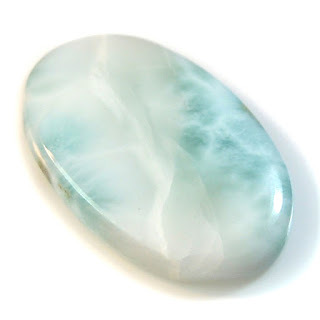 Amazonite is an appropriate stone for Aquarians, promoting vitality for all those who wear it. Often worn by gamblers, amazonite is said to attract luck and good fortune. When worn as an amulet, it can protect against a wide variety of ailments and diseases. General Information: Amethyst is one of the most precious and valuable stones belonging to the quartz group of minerals, with exception to rare blue-green gem silica. It is recognized as the official birthstone for the month of February. Physical Properties: Amethyst belongs to the macrocrystalline branch of quartz and owes its violet/purple color to iron and aluminum impurities. Without such coloring agents, amethyst would simply be transparent, ordinary colorless quartz. Metaphysical properties: Amethyst is the birthstone for those who are born in February or for the zodiacal sign of Pisces. Amethyst has healing powers to help with physical ailments, emotional issues, and in Energy Healing and Chakra balancing. Amethyst crystal therapies are primarily associated with physical ailments of the nervous system, the curing of nightmares and insomnia, and balancing the crown chakra. General Information: Fluorite is considered to be one of most popular minerals in the world among gem and mineral collectors, second only to quartz. It is often referred to as 'the most colorful mineral in the world' owing to its variety of brilliant colors. Physical Properties: Fluorite is frequently fluorescent under ultraviolet UV light. The fluorescence is thought to be due to impurities of yttrium or other types of organic matter within the crystal lattice. The color of visible light emitted when a sample of fluorite is fluorescing appears to be highly dependent on where the specimen was collected. Metaphysical properties: Many people believe fluorite has a calming effect on the body. Fluorite increases intuitive abilities, links the human mind to universal consciousness, and develops connection to Spirit. This stone stimulates the third eye chakra, throat and crown chakra. Country of Origin: It is found only in a limited deposit in the Dominican Republic. General Information: Larimar is a blue variety of the mineral Pectolite. Pectolite is not a rare mineral and is found throughout the world, but the exquisite sea-blue color exhibited in the Larimar variety is very unique, and only comes from one place in the world. Physical Properties: The color of Larimar is caused by copper inclusions. Its color is rarely solid; it is almost always blue with interconnecting white lines and rough circles. A radiating pattern of crystal needles can often be observed within the Larimar. The blue color can vary in intensity from very light to greenish-blue to deep sky blue. Deeper blue colors and less white are more desirable. Metaphysical properties: Larimar is also known as 'the Atlantis stone', based on old legends which claim that the Dominican Republic was once part of the lost city of Atlantis. This association makes Larimar very important in the world of metaphysical gems. It is believed that the energy of Larimar can help to enhance spirituality and communication. It is a stone which is able to soothe emotions, cool tempers and alleviate stress, bringing a feeling of calmness to its wearer. This stone works best with the heart, crown and throat chakras. General Information: Seraphinite is the trade name given to a variety of clinochlore, which belongs to the chlorite group. The name seraphinite comes from the Greek word "seraphim", which refers to a celestial being with three pairs of wings. This could be due to the silvery feather-like chatoyant fibers that can be seen in seraphinite. These fibres are a result of mica inclusions. Physical Properties: Seraphinite is typically dark-green to gray, with silvery chatoyant fibers. These silvery mica inclusions may be sparsely or densely distributed throughout the stone. 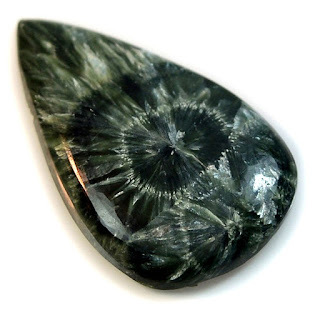 The luster of seraphinite can be pearly, vitreous, greasy or dull. General Information: Quartz stones that contains mineral inclusions are called "rutilated quartz" or "sagenite", popularly known as Venus-hair stone. Rutiles are small needlelike crystals. These may be red, black or brassy yellow. 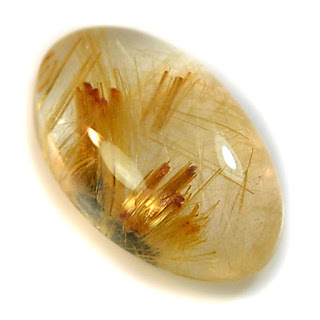 Physical Properties: Golden Rutile is a titanium dioxide mineral, and sometimes contains large quantities of iron oxide. When the iron oxide content is high, the rutilated quartz may have needles of gold and red in it, and when the content is lower, it may have a darker color to it, such as black. Metaphysical properties: Rutilated quartz is highly energizing and can bring passion into difficult times or difficult projects. Because it heightens energy, it is important for illuminating the soul, removed barriers to spiritual growth and filters negative energy. It is very powerful within all of the chakras from the heart chakra up.